The 2013 Flood resulted in extensive damage to residential and business property, as well as to Boulder County roads, bridges, creeks, and open space. Long-term recovery efforts are beginning to wind down nearly six years after the damage occurred. View some of our project pages linked here to take a look at how Boulder County has responded to this historic disaster. Sign up to receive Boulder County flood recovery information and news via email or text message. You can unsubscribe at any time. 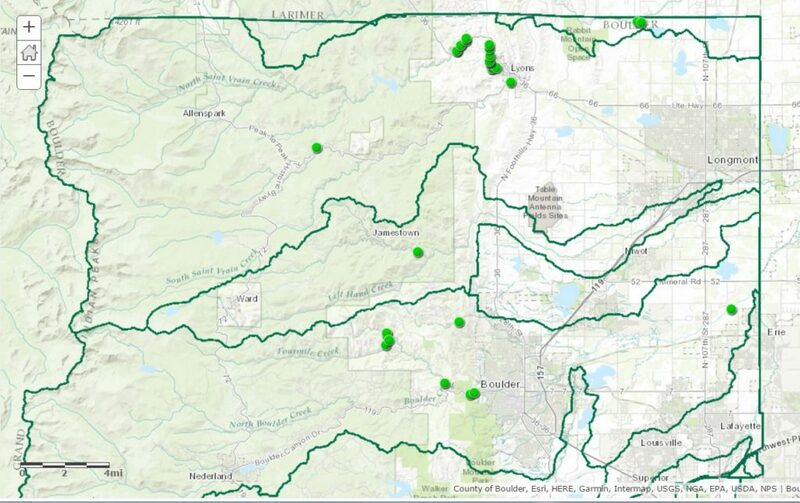 View a story map below that was a joint effort between Boulder County and the Urban Drainage and Flood Control District. Explore the 2013 Flood impacts as well as other floods in the state’s history. Recovering from the 2013 Flood is a multi-year commitment for Boulder County, the municipalities, and our community as a whole. Boulder County is committed to building back stronger and more resilient than before. One program that Boulder County administered in the wake of the 2013 Flood is the Buyout Program. This program purchased flood damaged properties that may have a threat of future danger and turned the property into undeveloped land in perpetuity. Applications for the program were accepted through July 2016, and the acquisition and demolition are complete. View a map of the 47 total properties acquired. In September of 2018, the Boulder County Commissioners assigned management responsibility for the properties to either the county’s Transportation Department for road rights-of-way or to the Parks & Open Space Department for open space. View more information on Boulder County’s Management of Flood-Buyout Properties. On the Community Development Block Grant – Disaster Recovery (CDBG-DR) webpage, you can learn how federal grant money administered by the county was used to help hundreds of Boulder County residents pay for a variety of flood recovery projects.